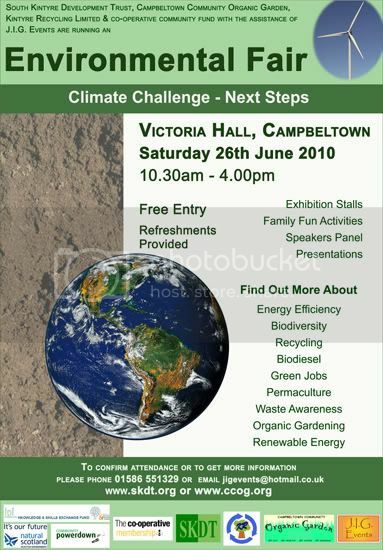 On Saturday 26th June 2010 from 10.30am until 4.00pm in Victoria Hall, Campbeltown Community Organic Garden, Kintyre Recycling and South Kintyre Development Trust are working together through JIG events, to host a FREE environmental day where all our community can enjoy garden/recycling/alternative energy workshops along with your personal carbon footprint check, facepainting, smoothie bike and free refreshments. As you enter you will receive a free biodegradable info wallet and a simple registration card which will be entered for our prize draw. There will be short, associated presentations along with questions and answer sessions throughout the day with relevant information on the stands within Victoria Hall. As this is the year of Biodiversity come along and enjoy the day while having your questions answered, finding out what it means to you and collecting all the information on all the above and more. Remember the day is free and you can choose to have a seat and listen to whatever presentation interests you or browse the stands gathering info and enjoying your healthy, self energised smoothie drink and refreshments.